Our last news letter was in May and I do apologies for not writing one in June but as some of you might know I attended a Alexandra Kurland clicker training course in England in June and what an absolute inspiration that was. For the next few months I will be explaining topics like Positive Reinforcement, Behaviour Modification, Free Shaping, Clicker Training and more. I will also be presenting a workshop on the 17th of September discussing these topics in more detail as well as general training issues like re call, lead walking etc. We will also have spaces available to bring your own dog with so that we can do hands on training work with both you and your dog. Please contact us on training@dog-care-centre.com if you are interested. This workshop is a follow up workshop on our Dog Behaviour and Body Language workshop that I presenting this weekend 16 July. Behaviour Modification is to change the problem or unwanted behaviour (as the behaviour is acceptable to the dog) through changing the dog's response to his environment. This is not "obedience" training in the sense that you teach a dog cues like sit and stay but rather using some of the cues learned as part of the behaviour modification to actively change the reaction of the dog to his environment. For example how a dog reacts to thunder. Behavior modification is based on the principles of operant conditioning, which were developed by American behaviorist B. F. Skinner. Two widely used methods that are used is through positive reinforcement which is to increase wanted behaviours by adding something positive like treats for example and negative reinforcement by taking something away to increase behaviour. This is different from negative punishment which decreases behaviour by taking something away. The problem with this is that the dog is likely to revert back to the unwanted behaviour the moment the aversive method is removed. With positive reinforcement the outcome of the dogs reaction to it's environment is only positive. With Positive Reinforcement the dog is learning a new behaviour as well as replacing the previous unwanted behaviour with wanted behaviour. There is a huge difference in focusing on wanted behaviours instead of focusing on unwanted behaviours. Once you are trained to do that training becomes much more clear and easy to apply. Take it for yourself. Do you perform better at work or school when your boss or teacher constantly tells you what you do wrong or when they tell you what you are doing right and help you work on what you still need to change? It is scientifically proven that animals and humans learn better and remember better through positive experiences. Hope to see you at the Workshop. Visit us on Face Book. 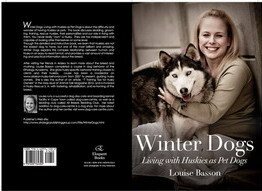 Winter Dogs; Living with Huskies as Pet Dogs- Now also available on Amazon.com, Barnes&Noble.com and Kalahari.net,www.loot.co.za,petspublications.co.za., exclusivebooks.co.za and many more This book is aimed at Husky owners learning about the breed or wanting to know more about sledding as well as people interested in getting a Husky. For your convenience make use of our online store with imported and local dog products to choose from. From grooming products, food, toys, treats, mushing gear and carts, collars and leads and much more!